This self-portrait of NASA's Mars rover Curiosity combines dozens of images taken by the rover's Mars Hand Lens Imager on Feb. 3, 2013. The portrait was taken at the rock target "John Klein," where the rover collected the first ever bedrock sample of Mars using its drill on Feb. 8. NASA is holding a press conference today (Feb. 20) to discuss the latest Red Planet activities of the Mars rover Curiosity. Scientists will likely provide an update on Curiosity's first bona fide drilling operation during the press conference, which begins at 3 p.m. EST (2000 GMT) today. "Earlier today, Curiosity engineers confirmed the rover had collected the first-ever sample from inside a rock on Mars," NASA officials wrote in a media advisory today. NASA will provide live audio of the press conference, along with participants' visual aids, at http://www.nasa.gov/newsaudio and http://www.ustream.tv/nasajpl. SPACE.com will carry the NASA feed here. 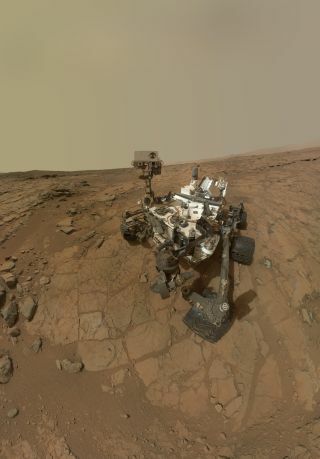 The 1-ton Curiosity rover landed inside Mars' huge Gale Crater last August, kicking off a surface mission to determine if the Red Planet could ever have supported microbial life. The six-wheeled robot carries 10 different science instruments and 17 cameras to aid in this quest, as well as several other key tools, including a rock-boring drill. The drill allows Curiosity to access the interiors of Martian rocks to a depth of 2.5 inches (6.4 centimeters), deeper than any other rover has been able to go. Curiosity first used the drill to its full capacity earlier this month, boring deep into a rock on an outcrop dubbed "John Klein," which was exposed to liquid water long ago.